People Power Day (People Power Anniversary and EDSA Revolution Anniversary), is a commemoration of the People Power Revolution in Philippines which overthrew the leadership of Ferdinand Marcos in 1986. People in the Philippines consider People Power Day as a restoration of democracy in their country. 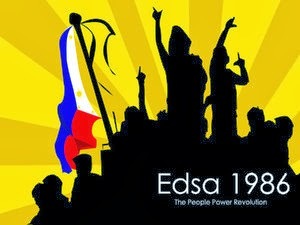 People Power Day dates back 26 years. During 22-25 February 1986, a huge mass of people held rallies on the streets of Manila. The people demanded the resignation of the Philippines Government of the time since the Filipinos protested against their Government which was corrupt, fraudulent, ruthless, and oppressive. Not a national holiday in Philippines, however all schools are closed while businesses and stores remain open. Filipinos celebrate People Power Day by wearing yellow which is the official color of LABAN party. They also make Laban sign by using the forefinger and thumb to form the letter “L”. Many activities and celebrations of People Power Day are held in Manila with EDSA road as the major spot of celebration where a lot of citizens gather around.